Derry captain Ryan McBride is anxious to return to action after two frustrating weeks in the stands. DERRY CITY skipper Ryan McBride insists he’s learned his lesson after a ‘frustrating’ two match ban and is desperate to win back his place at the heart of the defence for Friday’s match in Sligo. 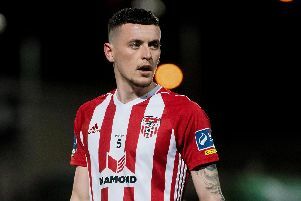 The 26 year-old Brandywell man was handed his suspension for a mis-timed tackle on Dundalk captain, Stephen O’Donnell, in the 5-0 loss at the start of July. Ryan McBride of Derry City is adjudged to have fouled Stephen O'Donnell of Dundalk by referee Paul McLaughlin resulting in a red card. Having served his punishment, McBride says he’s since apologised to his teammates for the rash challenge. And, while the robust defender won’t be changing his no-nonsense approach to the game, he has promised to time his tackles better. “I apologised to all the boys after the game and accepted that it was my fault,” he said. “These things happen in football and you just have to get on with it. “The match just wasn’t going for me at all. I missed a few headers and was all over the place. I think I got myself too psyched up before the game and came out and was kind of flat. I’ve no problem sitting on the bench if the boys are doing well. They picked up two clean sheets. But I want to come in now and try to get my place back. The ‘Candy Stripes’ have bounced back from that loss, despite McBride’s absence, with two straight wins and two clean sheets. Danish defender Niclas Vemmelund has looked solid at centre half alongside Aaron Barry while teenager, Conor McDermott, continues to impress at right-back and was in contention for the ‘Man of the Match’ accolade in Friday’s 1-0 won over Bohemians. McBride admits he would understand it if he was named on the bench for the trip to the Showgrounds this weekend. Ryan McBride, left, of Derry City is shown the red card by referee Paul McLaughlin during the SSE Airtricity League Premier Division match between Derry City and Dundalk. McDermott, however, will miss the game due to personal circumstances, so it’s expected there will be no obstacles in McBride’s way as he plots a return to action. His central defensive partnership with Barry was one of the best in the league during the first half of the season and McBride believes it can only get stronger as the season progresses. “It’s not easy watching from the sidelines,” continued the skipper. “It was bad enough getting a two match ban but I’ve missed three or four weeks now because of the two week break as well. “I travelled to the match on Friday and it was hard to watch from the stands so I’ll be glad to get back. “The boys have done class in the last two games. Big ‘Nico’ was great at centre half. “Conor McDermott is unavailable this week and, if he wasn’t, I would probably be expecting to be sitting on the bench because they’ve been playing so well,” he admitted. “Conor played well in the two games. That’s only good for the team because he’s young and confident. He’s great on the ball and his heading, passing and overall defending is good. “I was watching him against Bohs and, up against big Akinade, who is 6’ 4’’, he’s still out-jumping him for headers. “I’ve no problem sitting on the bench if the boys are doing well. They picked up two clean sheets. They hammered Longford and beat Bohs 1-0 so they’re doing class at the back. Derry face two important games in the space of four days with the match against Sligo Rovers followed quickly by the EA Sports Cup semi-final against Limerick at Brandywell on Monday. However, McBride is confident his side can pick up two vital wins and ambitiously claims it would be foolish to rule Derry out of the race for second now that they find themselves three points behind Cork who will be ‘playing catch-up’ due to their European adventure. “It’s another massive game for us. Every game is big for us now but Sligo are playing well at home. Everytime we play Sligo, Rafa Cretaro always gives us some problems. “So we have to deal with him. But I would hope we could come away with three points. “We’ve a lot to play for and I don’t see why we can’t challenge for second because we’re just three points behind Cork who have two games in hand. “But I think Dundalk and Cork will have a backlog of fixtures and will be playing catch-up. “Hopefully, that takes a toll on them,” said the Derry skipper.